When Ed and I founded Sunrun 10 years ago we were motivated by a desire to provide clean, affordable energy to Americans so that we can continue to enjoy the beautiful planet we live on. One of our proudest accomplishments has also been the employment opportunities Sunrun has been able to create across the nation. The solar industry in America employs more than twice as many Americans as the entire coal industry and just as many as the natural gas industry. More than 260,000 people work in the solar industry and that number is expected to grow to 286,000 within the next 12 months. 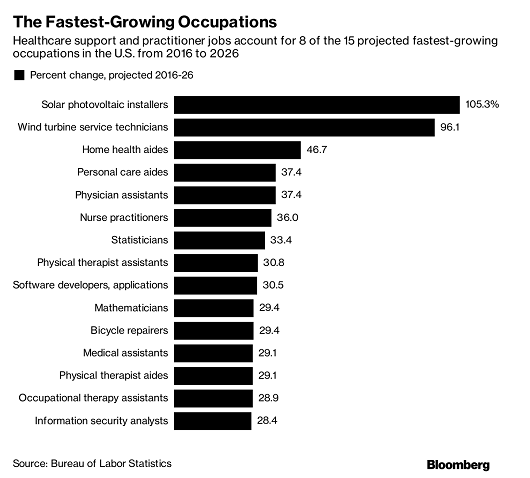 In 2017, the U.S. Bureau of Labor Statistics projected that solar panel installers will be the fastest-growing occupation in America in any industry over the next decade. Because renewable energy replaces fuel costs with labor, the result is lower-cost energy and increased employment. For example, residential solar employs 10 times as many people per megawatt-hour than the overall energy grid today, while delivering a lower-cost energy for American households. These jobs are in 50 states, year-round, well paid, and cannot be automated or exported. The solar industry is also becoming a lot more diverse; with more women, Latinos, and African Americans joining the workforce. Sunrun recently featured on Comparably’s annual list of Best Companies for Women and we hope to set the tone for the industry that will inspire a new wave people to carve out careers in solar. Importantly, nearly 10% of solar works are veterans - which is a higher rate than any other job sector in the economy! Paired with home batteries, rooftop solar provides energy and services that further strengthen our power grid. Solar and storage represent a future bright with nationwide employment that’s fueled by strong consumer demand. We should embrace solar technology for its employment - and environmental - benefits and as part of a diversified energy portfolio.